The review posted below is from Masslive.com, it came out yesterday, and was my inspiration for choosing the Swan for tonight. Stay tuned, I'll let you know how they did this weekend. Check out the the Table Three Restaurant Group. There are some familiar, and very talented people making some wonderful culinary changes here locally. Time to get out of the house, and do some local dining. 02/03/03--Sturbridge--Staff Photo by Dave Roback--The Whistling Swan at 502 Main Street in Sturbridge. 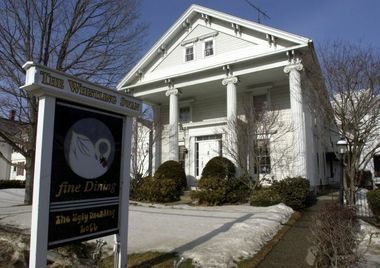 A longtime mainstay of the Sturbridge dining scene, the Whistling Swan is in the midst of major changes. Now operated by the Table 3 Restaurant Group, the establishment recently welcomed Rob Fecteau as its executive chef. Fecteau is a local boy – he grew up in nearby Spencer – but his culinary vision is decidedly cosmopolitan, thanks to stints in high profile eateries across the Northeast. The menu focus at the Whistling Swan has shifted from Continental to contemporary American, with current entree choices including Buttermilk Fried Chicken ($15.95), Cracker Crusted Haddock ($16.95), and Lobster Mac ‘n’ Cheese ($18.95). “Cast Iron” Steaks are a specialty, with options such as Sirloin Tips ($17.95), New York Strip ($23.95), and Bone-in Rib Eye ($29.95). Starters range from Frizzled Onions ($2.95) and Sweet Potato Fries ($4.95) to Shrimp Scampi Bruschetta ($9.95) and Cod Cakes ($8.95) with sweet cream corn. The Avocado Club Spring Roll ($8.95) combined Oriental architecture with Tex-Mex flavor. Filled with a mixture of shredded chicken, grated Cheddar cheese, mashed avocado, and bacon, the two deep-fried wrap-ups had a robust, somewhat spicy, richness. Ranch dressing spiked with chili powder was provided as a dip. Chicken Parmesan Alfredo ($15.95) is a mashup of two Italian favorites. Arranged on a bed of fettuccine Alfredo, a panko-crusted breast of chicken is topped with marinara, more Alfredo sauce, and grated Parmigiana before being run under the broiler. The result is quite likable, with the mellow, cream-and-cheese Alfredo softening the marinara’s inclination toward the sassy and sharp. Our only grumble with the dish? Much too much to finish in one sitting, we discovered. A Filet Mignon ($26.95) earned high marks, not only for the quality of the steak but for the skillful manner in which it had been cooked – not a hint of bitter, crunchy broiler char marred its exterior. Chef Fecteau had instead sauced the steak with a first-rate demiglace. Deeply satisfying and perfectly seasoned, the sauce impressed us with its admirable balance of flavors. We’d upped the ante on our steak dinner, opting for a “Surf and Turf” enhancement ($7.95). The kitchen had evidently run short of jumbo shrimp, since it substituted somewhat smaller specimens. Grilled, then glazed with butter, the crustaceans were tasty but somewhat overcooked. Ultra-yummy “smashed” redskin potatoes and steamed pencil asparagus completed the handsomely styled plate. The new menu at the Whistling Swam, it should be noted, is relentlessly a la carte – neither salad nor bread is built into the dinner price. Fully licensed, the restaurant maintains a wine list of about two dozen choices. Prices are moderate, with nothing going for more than $40. Dessert, we discovered, is reason enough to visit the Whistling Swam these days. The current selections (all are priced at $8) include a dark chocolate truffle cake, Nutella ice cream profiteroles with coffee hazelnut caramel, and a carrot cake cheesecake iced with marshmallow glaze. Instead of picking ourselves, we opted for the Chef’s Tasting ($13.95 for two), a dessert deal that incorporates three selections of the chef’s choosing. White chocolate mousse served in a pistachio cookie cup was soothingly sweet, while a bread pudding made with chocolate cake and raisin bread had a deliciously dense character. Our favorite, though, was the cinnamon cream brulee, its namesake spice surprisingly subtle and hard to identify. The Whistling Swan’s available-all-day menu also incorporates sandwiches and stuffed cheeseburgers as well as several hearty-sounding entree salad plates. Though a major facelift is planned, for now the decor remains the familiar Victorian downstairs and contemporary loft layout that’s characterized the Whistling Swan experience over the last several decades. One other area we’d suggest needs work is service. Though adequate, it will require fine-tuning if the restaurant is to achieve the “top tier” status for which its new owners claim to be striving. Hours: Open daily, serving lunch from 11:30 a.m. to 3 p.m. and dinner from 4 to 9:30 p.m.
© 2011 masslive.com. All rights reserved. Wally and Mary sitting in a tree K.I.S.S.I.N.G!